Affordable Bathroom Remodeling in the Northern Virginia area. AirPlus specializes in making luxury residential bathrooms in Northern Virginia for an affordable price. We take pride in providing quality home transformations from Alexandria to Centreville, Woodbridge to Great Falls and everywhere in between. Our Remodeling Specialists will ensure that even your most spa-like bathroom dreams become a reality! From creating storage solutions in a guest-bath or designing a more open-concept master, we will work with you on maximizing your home’s potential, without maximizing cost. We understand that renovations can inconvenience our clients and strive to meet deadlines while communicating with you throughout the remodel process. AirPlus is fully insured and our Remodeling Specialists are Class A BLD and Class A Tradesmen licensed as well as Class A Gas, Electrical, Mechanical and Plumbing licensed. 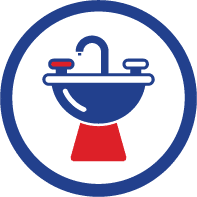 Your bathroom renovation project will be managed and carried out by our highly qualified employees so you never have to deal with the hassle of subcontractors!